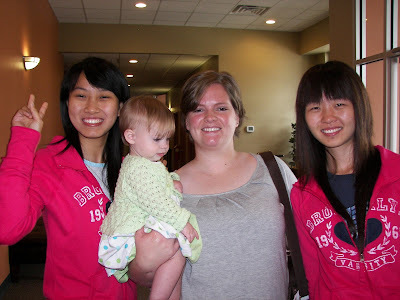 This is a picture of our oldest daughter and our grand-daughter and 2 of our new friends. Often we face changes in our life that leave empty holes. It can be anything from “empty nesting” to losing a spouse or loved one…. from changing jobs to having a friend move away. Change is constantly happening in life. The changes that have happened to us in our own life have encouraged us to create change in other ways. Now being “empty nesters” and not quite ready to “retire” is an odd place for us to be. We love being with kids, college age kids in particular, and have for several years (even before our kids were that age). Something about that age is amazing….they go to college because they want to, not because they have to. They choose their career path, where they want to live, and have to accept the baggage that comes along with those decisions. They want to be adults, but usually not like their parents. They want adult conversation, but not to be told what to do. It’s perplexing and interesting. We have started to go into a new area of involvement….being involved with International Students. Specifically, we are getting involved with 2 groups that are allowing us to develop friendships with college age students that have come from other countries to study here in the U.S., and specifically in SW Missouri. Our goal: to grow friendships around the world; to learn about their home life, their culture and share ours; to be family for those that do not have any family nearby. We have already met 2 new friends through an activity off campus that was sponsored by one of the many clubs that are reaching out to the international students. These girls are juniors in college, and the farthest away from home than they have ever been. They talk to their parents nightly, and miss them greatly. Although they are in the “honeymoon” stage of being in a foreign land, they are both enamored and frightened to be here. They cook their own traditional food at home, but are excited to try new things, to experience all that they can. They want to be the best students that they can be, and hope it will bring honor to their families (and their country). This is serious business to them, but inside they are still college kids. The other group we are involved with is called International Friends. It’s sort of a “foreign exchange” program without housing a student. We filled out an on-line application, attended an orientation in Springfield, and selected a student to become friends with. I emailed her this morning to introduce ourselves, and hope to hear back from her soon. We’ll do things together as her schedule allows things as easy as going to a park or museum, or an activity on campus. If time and finances allow, we may go to a local amusement park or see a movie or show and then discuss the activity in comparison to things in her home country. If we’re lucky, we will have an instant bond, and invite her into our home to share holidays and traditions. If she’s interested she can come to church with us; and if not, that’s ok, as I want to learn all about her, and what life is like in her home country, in her neighborhood, and at her family dinner table. International Friends is a great way for people to share their life and get to know someone else. It’s a great way to “be a friend” to someone who may not have one here. It does take time, but not money. It is more about building a friendship, and less about being a tour guide. It’s about sharing our daily life with them…as simple as that may be. I would encourage families and single adults to expand their horizons, give of themselves, and open their life to a new friendship through International Friends. You can visit their web site on line at: http://www.ifmo.org/ or contact local coordinators Roger and Becky Turnbough through the site if you have any questions. Not only do I expect to impact our new friends’ lives by being a friend to them while they are here, but I know that our lives will be changed as well. By getting to know them, we will be expanding our horizons and getting a peek at the world around us, beyond our national borders; and all without buying a plane ticket, learning another language, or leaving the comfort of SW Missouri.